The above is a little graph I whipped up to show an idea of how I might handle languages in my next D&D campaign. Tick each language you know. You can work out the general gist of a short conversation of a few passages of text of a language connected to one you know with a little time and a DC 20 Knowledge check. Languages represented by a star are weird, arcane and difficult, and require a DC 25 check to work out if you're not fluent, and a DC 15 check even if you are. The good news is, the Read Magic spell allows easy translation of writing in both Magic Script and Eldrich Tongue. 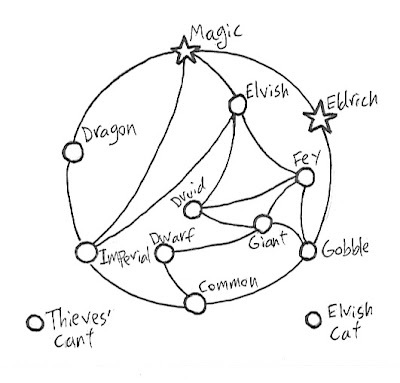 Thieves' Cant and Elvish Cat are pretty obscure, so unless you actively learn them, you've got no hope to work them out. 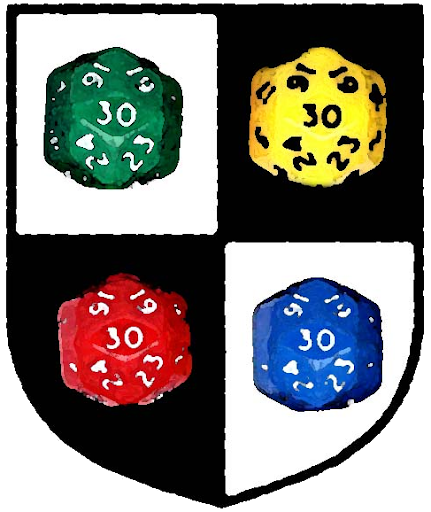 Each character knows Common, plus their native tongue (Elvish for Elves, Dwarvish for Dwarfs, Gobble for Goblins and Orcs), plus any languages that fit their class (Magic Script for mages/illusionists, Druidic for Druids, Thieves' Cant for rogues. Possibly Imperial for good Clerics and Eldrich for evil ones), plus an additional language per point of Mind bonus.